Fresh and contemporary this exquisite teapot has been hand-thrown in France. Made from white stoneware and porcelain, the jug is beautifully finished with a violet satin/matt glaze and has a wonderful luminous sheen. 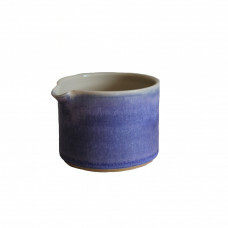 Each teapot takes about 8 weeks to make, they are fired at high temperatures so are durable as well as beautiful. Sue focuses on simple but beautiful shapes with an emphasis on form as a functional and decorative item. Enjoy a cup of tea poured from this fabulous teapot, it's bound to taste even better!